You put your time, effort and money into your equestrian business or personal horses, and all owners want the best for their animals. 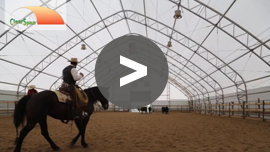 ClearSpan provides a superior option to traditional horse barns and indoor riding arenas. Our buildings feature a healthier environment that is naturally ventilated, reducing mold and fungus, and have no internal support posts, so you get a structure with the maximum riding or boarding space. Our designs can provide an atmosphere that lacks shadows and is spook free, while also creating a climate that is ideal for horses. ClearSpan’s unique and distinguished line of equine building solutions are made from the finest, highest-quality materials, ensuring that equestrians get a building that is durable and dependable. ClearSpan supplies the perfect building solution by creating a one-stop shopping experience, including in-house design, manufacturing, financing and installation, with everything needed to maintain a fully functional equestrian building. With multiple designs, including fabric, metal and hybrid buildings, there is a structure for any equestrian application that can be tailored to even the most specific needs. ClearSpan provides economical foundation options, quick construction timelines, as well as turnkey, stock and design-build solutions, creating budget-friendly structures in a fraction of the time it takes to build traditional wood or red iron buildings. ClearSpan frames are built with USA-made, triple-galvanized structural steel that is corrosion resistant and feature an industry leading 50 year warranty. Building solutions are available up to 300’ wide and at any length, ensuring that no matter the application, there is plenty of available space. ClearSpan buildings can be engineered to meet any municipal and regional building requirements, and these structures can withstand balanced and unbalanced snow loads, as well as a minimum of 90 mph winds. Numerous cover options, including fabric or metal, create an ideal environment. ClearSpan fabric covers feature a 20 year warranty and provide the ability to eliminate the need for artificial daytime lighting by allowing the sun’s light to shine through, creating a bright, well-lit atmosphere that lacks shadows and reduces energy costs. The fabric covers are climate sensitive and actually keep it cooler in the summer and warmer in the winter. Besides providing an energy-efficient, money-saving option, ClearSpan’s fabric covers are also 100% recyclable, ensuring environmentally friendly building solutions that anybody can appreciate. One of the biggest factors when deciding on an equine building is the type of foundation. ClearSpan provides a number of different foundation options that can be temporary or permanent and provide a solution that can be quickly and easily relocated or expanded upon. Many equestrians opt for ClearSpan’s Helical Anchoring System. The system is a cost-effect solution that allows customers to build quickly and avoid timely and costly excavation. Due to the temporary nature of these buildings, they generally require little to no property taxes, and this, combined with the minimal required maintenance and the lack of space for rodents and other pests to occupy, creates a solution that is easy and low in cost to maintain.